Marin County’s Here. Now. Us. project brought together a group of professionals from diverse disciplines to imagine a mode of engaging people in an active conversation about a local problem with global implications – sea level rise. Marin’s challenge is two-fold: It already endures major flooding that impacts the built environment, and this flooding is projected to become much more severe in the near future. The question for Here. Now. Us. was how to invite the public into a dialogue about the challenge and potential responses. For those who aren’t familiar with Here. Now. Us. here’s some background. 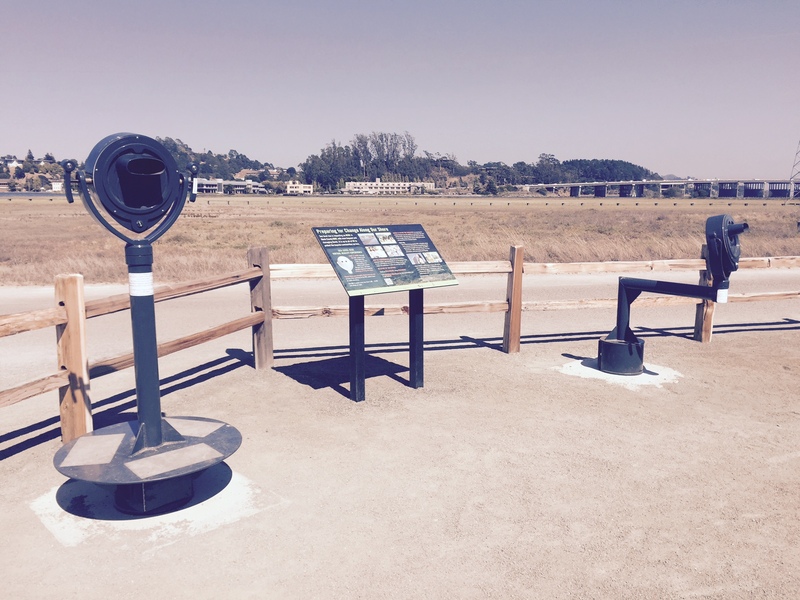 In May 2015, two OWL digital viewfinders – a device modeled after the classic coin-operated binoculars commonly found at scenic viewpoints – were installed on the multi-use pathway in Mill Valley, Marin County. The viewfinders have been modernized with a virtual reality function and loaded with projection data from several leading sources that allows passersby to witness current and future sea level rise impacts on the surrounding area. This included two flooding scenarios: a 3D visualization of current risks based on December 2014 storm levels that shut down a local highway, and a second visualization showing what an additional three feet of sea level rise would look like for the very spot users are standing in. The viewer goes one step further by presenting what two different responses to sea level rise could look like, visualizing a future community that has adapted to a changing climate and learned to live with water. These last two scenarios are key components of the user experience and partly what makes Here. Now. Us. so exciting. By visualizing the problem and possible ways to respond to it, users will hopefully be motivated to take action in support of a response that feels most appropriate or desirable. The response scenarios selected represent two extremes on the spectrum of engineering applications that might be selected to address flooding in an environment similar to the site. 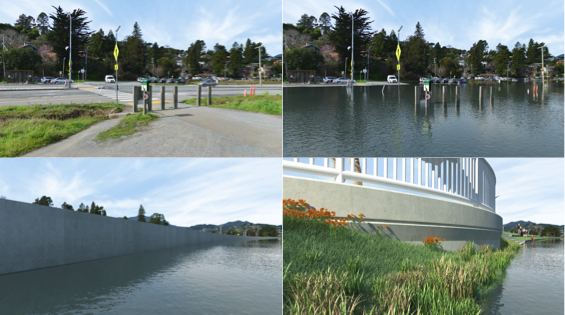 Our first scenario shows the viewer an 8-foot concrete sea wall, and the second displays a ‘hybridized’ levee: One incorporating low-slope stretches for ecological value, a pedestrian and biking infrastructure atop it and a viewing area for people to look out upon the marsh plain. The visual effect of the sea wall is bleak, representing a strong “dividing” element, while the levee served as a mode of connecting – both in the transportation aspect and, visually, between users and the environment itself. How does showing these images catalyze a cultural conversation about the challenges posed by sea level rise and the possible responses? Answers will vary. But the process of collaboratively designing the experience of the installation says a great deal about the ethos of this approach. Fundamentally, creating a platform for public awareness is an effort toward a democratic ideal: That ordinary people should play a decisive role in defining what kind of society they chose to live in. Moreover, that the project is overtly and earnestly geared toward receiving and encouraging feedback (users are invited to share their thoughts about sea level rise and the visualizations they’ve seen through an interactive survey) represents a compelling paradigm for empowering citizens to become active participants in their societies and the ways in which they will chose to adapt to an uncertain future. Marin County’s Here. Now. Us. Project is an example of utilizing a local flooding problem as a wedge into a broader cultural conversation about climate change and the type of communities we want to live in. And the realization of this discourse, in many ways, was not only the goal of the project, but will increasingly emerge as a fundamental test for many projects of this type as societies around the word attempt to imagine and envision how they will adapt to a changing planet. As is so often the case with climate change and other environmental problems, these issues are about people and the choices we make, as individuals and societies, to shape the future. Fundamental to this view of the challenge is an acknowledgement of the capacity of people to affect their environment. But where and when and in whom does this awareness of our great power (and, many would assert, great responsibility) emerge? As in so many other endeavors in the human experience, actions are derivative of processes of contemplation and, importantly, communication. Nate Kauffman is a Landscape Architect, a consultant advising on issues of resilience, sustainability and adaptation design systems, a project manager for OWLIZED, and the founder of LEAP (the Live Edge Adaptation Project).